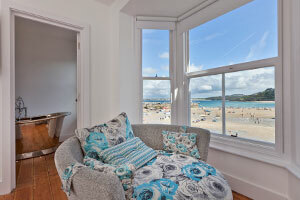 Julia Newnham opened St Ives House in July 2012 as a luxe boutique getaway perched on the wharf in St Ives. She bought the house in 2011 and lovingly restored it to create a luxury holiday getaway with a strong influence of the local art scene. 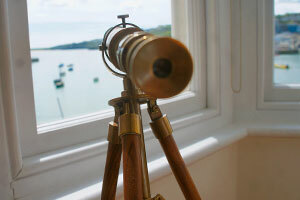 The Times has recently rated as one of the Top Ten beach houses in Britain. My children had been growing up at the same time as I was working at the Citizen’s Advice Bureau and I’d also gone back to university to do a post grad certificate in Psychology. Tourism is another favourite love. I was involved in The British Leisure Show for several years that encouraged glamping and all things outdoor, glamorous or basic that could be promoted in Britain. This inspired me to look around at the next holiday hotspots. I felt very strongly that after the ash cloud and other terrible world events going on at the same time as the UK recession, Britain by the sea would once again be very popular. I was very lucky and recruited some fantastic local tradespeople. We all worked tirelessly to get the house finished for the 2012 season. The house was gutted from top to bottom – it was previously flats. Everything was redesigned from scratch, including some of the furniture and it all was made locally by extremely talented people. 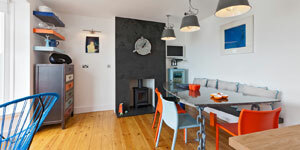 At the same time a couple were developing a boutique B&B, Trevose House, which is very stylish and has also done incredibly well. The timing was right. St Ives already had a fantastic following. I noticed the type and variety of restaurants was every increasing and easily becoming rivals to those in major cities. The standard was improving and it became a logical decision to design and invent a beautiful luxury home bang in the thick of it – right on the Wharf. 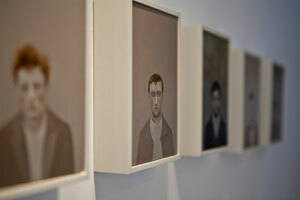 One of the unique things about the house is that I want the art to reflect what is going on currently in St Ives. The Tate obviously draws art lovers to the town and I felt very strongly that the current contemporary scene needed to be represented. The standard is extremely high with artists such as Tim Shaw [Royal Academy of Arts], Trevor Bell, Sam Hall, Sam Bassett, David Whittaker, Sax Impey, Sarah Balland indeed my partner, Richard Nott – all of whom have received fantastic national and international critical acclaim. The house itself provides a level of comfort and luxury not normally associated with a beach house. 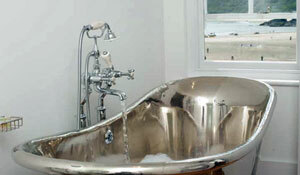 The very deep nickel bath is very popular – you can soak for hours using our own local brand aromatherapy products, whilst sipping a glass of Skinny Champagne, looking out to sea. 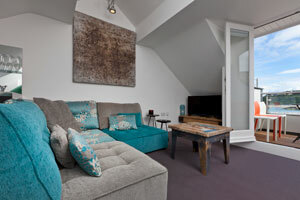 The master bedroom and kitchen diner are superb viewing bays to watch the calm on the Wharf in the morning and evenings and the hustle bustle of the crowds / buskers / surfers during the day. It is a fantastic people watching spot. We try to provide for the guests any services they require. However, I have found that once my guests are in the house, they relax so much they don’t want to rush around! 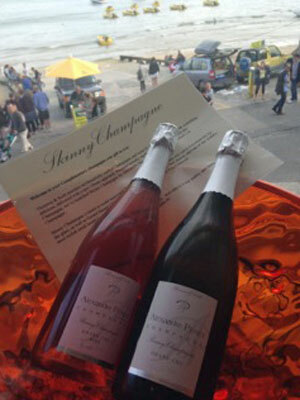 We provide complimentary Champagne on arrival both on the balcony and in the bathroom. We also have an honesty bar. I often serve the brilliant Skinny champagne especially to groups of ladies who book long weekends, as the house comes with spa and gym passes too. I met the founder of Skinny Champagne at Taste of London. My daughter and I had read about it and we were desperate to find it at the show. We managed but unfortunately after trying a few other brands along the way! I was struck by Amanda’s enthusiasm and knowledge of the brand. She was clearly a lady with an edge and I wanted to stock Skinny Champagne in the house as it’s a new concept and marries with “The new side of the seaside” (my theme ) beautifully. The guests love discovering the brand when they visit. To begin with, I made the mistake of not pushing hard enough when developing the website and consequently the finished product did not reflect the house at all. 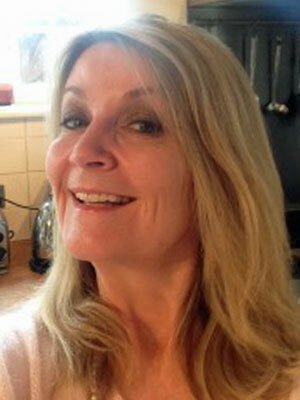 I therefore had to commission a whole new site which was an expensive mistake! It was one thing developing a property, but the real challenge came when I had to learn how to sell and service it. 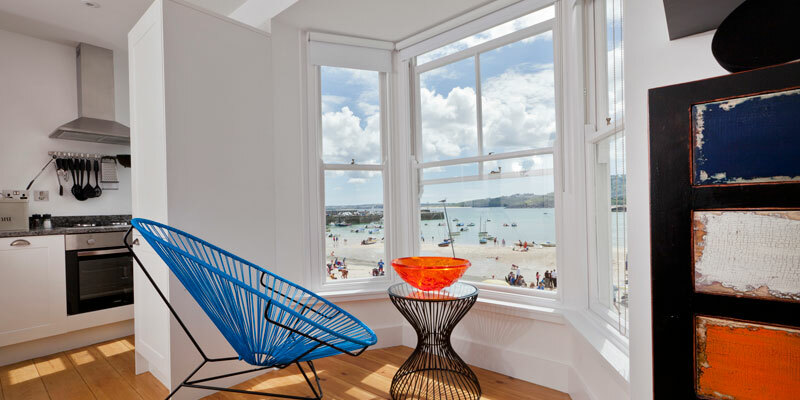 The double edged sword that presents itself while running St Ives House is the location is beautiful and that is what draws the guests … but it is a long way from London! I find it very hard to leave here when I need to go away. The relaxed feel of the place also can convince you that you are also on holiday. Maybe that’s not a bad thing? I have learnt that everyone books a holiday for different reasons and they all have different family dynamics. Listening to the client to find out exactly what they want took a while to perfect and it really does make the difference. Next year I want to improve on things I know I can now do better and work out more inventive ways of keeping the seagulls off the balcony! Not a bad life all in all!